A: 1. Quick Charge 3.0 charger adapter is highly recommended. 2. Turn off phone screen while wireless charging. A: Remove the metal plate or credit card from phone back. Q: It wireless charges intermittently. A: 1. Be sure your phone case is NOT thicker than 4mm (0.16 inches). 2. Be sure your phone aligns with bottom of the charger. Q: When use GPS, the battery start dropping. A: Wireless charge is 2~3 times slower than wire charge. We recommend to turn off phone screen while wireless charging as screen is the biggest power consumer. Q: Disconnected on bumpy road, and randomly connected. A: Bumpy road could affect phone's alignment with the wireless charging coil, would need re-align. Q: What case can I use? A: It is not compatible with Otterbox, Zizo, UAG cases, and cases that are uneven/rugged. 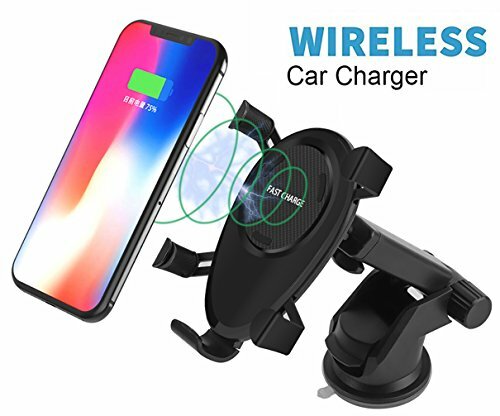 2-in-1 Car Mount Holder & Wireless Charger: Wireless charging car mount combines phone charger and car mount in one unit, 360°rotatable ball enable to hold the phone in a perfect viewing angle while driving. Universally holds most phone and case combinations from 2.44"-3.22" in width (charging mode just support case within 2mm thickness), saving money from a normal mount. Diverse Mounting for Convenience & One-hand Operation: Support mounting on air vent or bracket base on windshield, dash board, bracket base Installation with a Telescopic Arm extending from 4.13" - 6.3", and pivoting on 270° arc for a variety of optimal positions. With Auto-grip Gravity Linkage Design, this car mount will grip and secure your phone when you put in. Super convenient with one slip to take it out. It is convenient to use and significant especially when driving. FLEXIBLE USE: The 360°rotatable head bracket lets you adjust the phone angle horizontally or vertically to meet the best visual orientation while driving. Adjustable holder length, You could adjust the length of the holder to fit your phone to the best charge position. This product uses the principle of gravity, So please note that when the phone is installed, please Keep your cell phone center of gravity down,can not Horizontal or Inversion. Hassle-free Purchase: Built-in intelligent chip with over-voltage, temperature control and other more safety features, self-adaptive to the required current and charge quickly. Support 9V/2A quick charge and 5V/2A standard charge. (It's normal for your phone to get warm.) We offer a 45-day money back and 18-month guarantee! Any question please do not hesitate to contact the customer support for help. If you have any questions about this product by DINTO, contact us by completing and submitting the form below. If you are looking for a specif part number, please include it with your message.